The Toronto band formerly known as Slyde returns with a slight modification to their moniker, The Slyde, to drop their second full-length album, Awakening. Actually, the album isn't entirely new material. It's six new songs with the addition of last year's four song EP Back Again. In light of this I will only be considering the six new songs in review. If you want to know more of the EP, read my favorable review of Back Again. Essentially, the new songs are merely a continuation from those heard within Back Again. (Actually, there's only five songs to consider since the first is merely a 37 second instrumental opening.) The Slyde song arrangement builds upon intertwining mixed melodies, polyrhythms, generally quick pacing, sharp riffage, expansive guitar solos, expressive synths with some video game sampling, and Nathan Da Silva's melodic and somewhat pitched voice lilting over all. 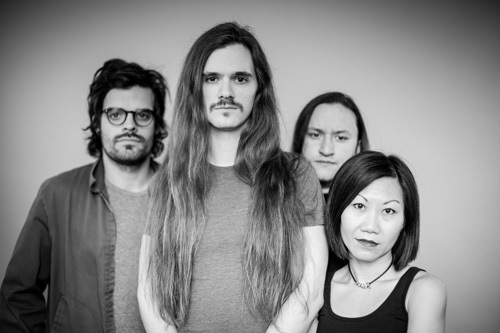 In other words, this is modern melodic progressive rock reminiscent of Coheed and Cambria. What binds all these things together to make a song accessible, rather than an exercise in prog wonkery, is vocal harmony, simple rock groove, and the fact the melodies pair so easily. As for the songs, in some sense, they are indistinguishable from each other as they all have the recurring aforementioned themes. Yet for each, there can be some element or elements that stand out. For a song like So Blind it's the catchy refrain and its vocal harmony. With Awakening, it's the large guitar solo at three quarter point followed by a light piano breakdown. Within the fast paced Walk With Me, there's a fine synth solo after the midpoint. Also moving quickly, In Silence has another solemn breakdown with voice over piano and acoustic guitar, before roaring back to fast and heavy with a stinging guitar solo. Needless to say, with some careful listening you'll find the diversity in each song arrangement. In the end, Awakening finds The Slyde in their groove, creating inventive and consistent modern melodic progressive rock. Recommended. 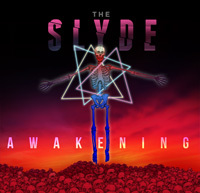 Awakening finds The Slyde in their groove, creating inventive and consistent modern melodic progressive rock. Recommended.